The Heads and other delegates will gather at the Eastern Caribbean Central Bank (ECCB) headquarters on the morning of June 21st for the ceremonial first raising of the OECS Flag, which was selected from among submissions by groups and individuals across the OECS region. The new OECS Flag will, from then on, be flown alongside flags of Member States at all OECS regional events. Here is the news for the OECS flag from the official site: http://www.oecs.org/Press%20Releases/news_new_flag_raised.html. What a "strange" flag! The flag and colour scheme represent a positive celebration of the sub-region, while never losing a sense of formality, projecting the OECS as a meaningful and increasingly strong voice within the Caribbean sea. The flag has an internal ring which shows the nine elements of the OECS, evolving into nine points of contact, radiating from the core, out into the region and beyond. There is an outer "O" which is for the OECS and which is circled by another ring, representing the world at large. The double ring gives the flag a constant dynamism, indicative of movement and growth. The central core of the flag, also carries a resemblance of a blossoming flower, and a tertiary resemblance of science and technology. The colours are fresh and clean, optimistic and bright as a "refreshed Caribbean" moving out to meet new opportunities, while the formal dark blue retains a firm, corporate and establishment influence. In addition to the flag, the new design will also be used as the new OECS logo, replacing the current logo which is designed as a handshake encircled by nine points and stars. The flag, logo and logotype were designed and developed for the OECS by Present Image Design Limited, a Total Identity Development and Image Management Company, located in St. Lucia. The company was represented and acknowledged at the flag raising ceremony. I note that there seems to be an inconsistency between the image and the photo posted on the OECS webpage on the one hand, and the written 'blurb' on the other, which refers to "the formal dark blue" which doesn't actually appear. 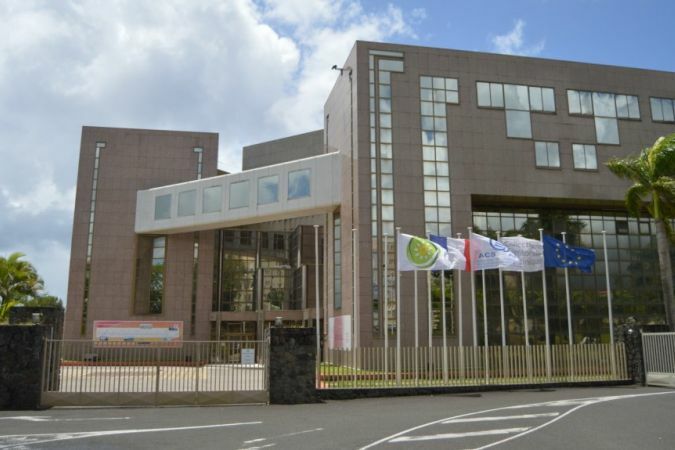 In front of the offices of the Collectivité Territoriale de Martinique one can see, together with the CTM flag, the French flag and the European union flag, a flag for the Organization of Eastern Caribbean States and a flag for the Association of Caribbean States. The flag of the OECS in front of the CTM offices is white with the OECS logo in a central circle.